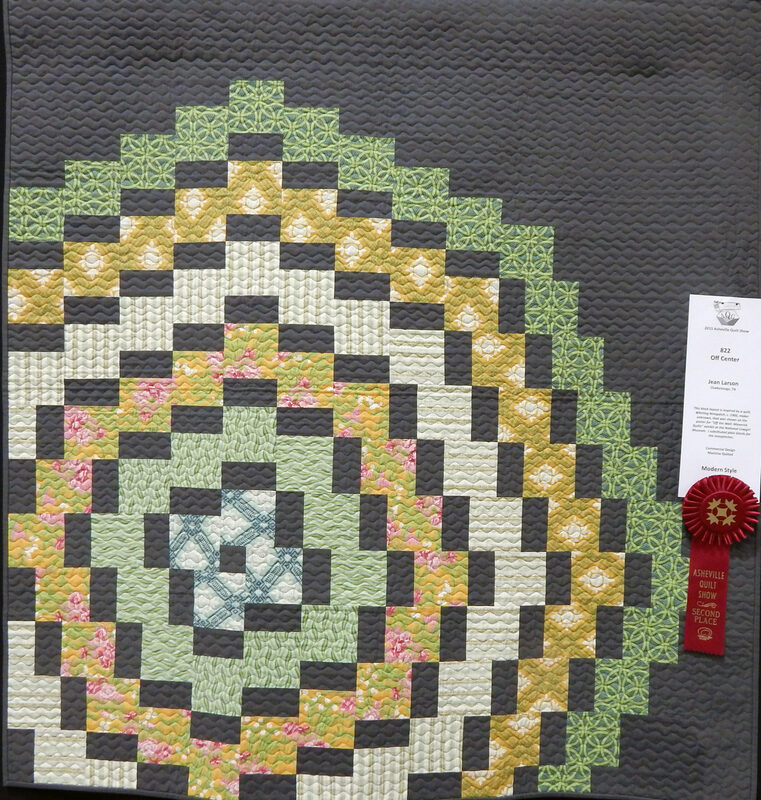 The Asheville Quilt Show isn’t juried, but it always has some outstanding quilts. Here are a few of my favorites this year. I was particularly struck by how many modern designs there were, even in the categories that weren’t designated “modern”. 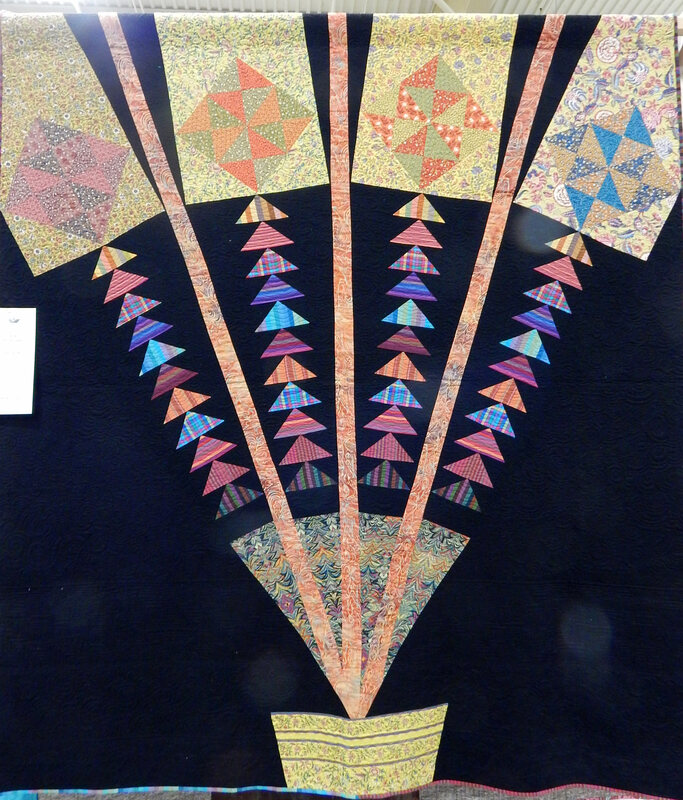 “Singing in the Rain”, by Elizabeth Allen, was one of many modern-style quilts entered in other categories. 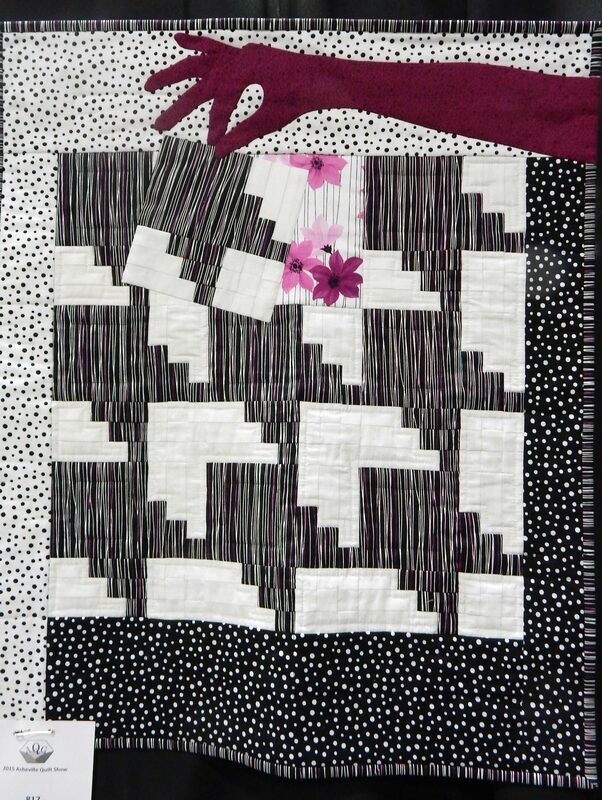 Love the rain-texture quilting! 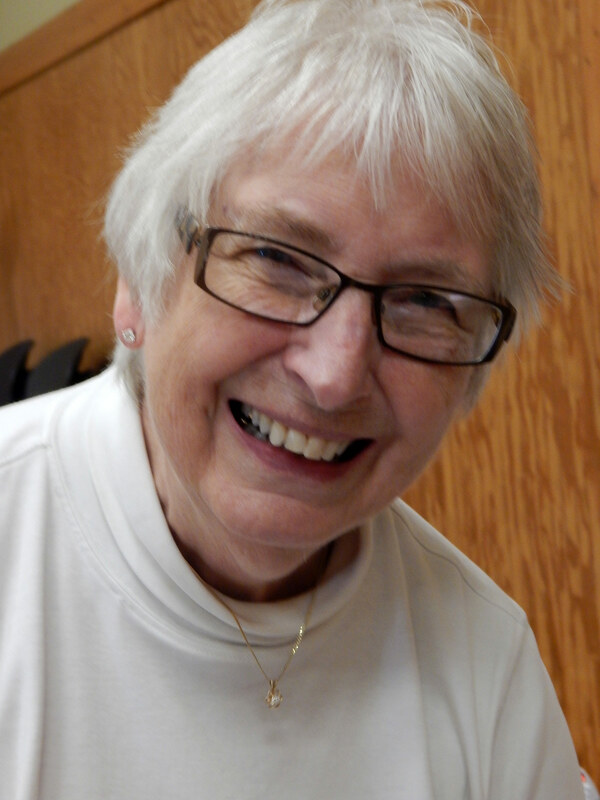 Phyllis Tarrant stated her “Geese in the Parking Lot” made use of principles taught by Joen Wolfrom. Wow! 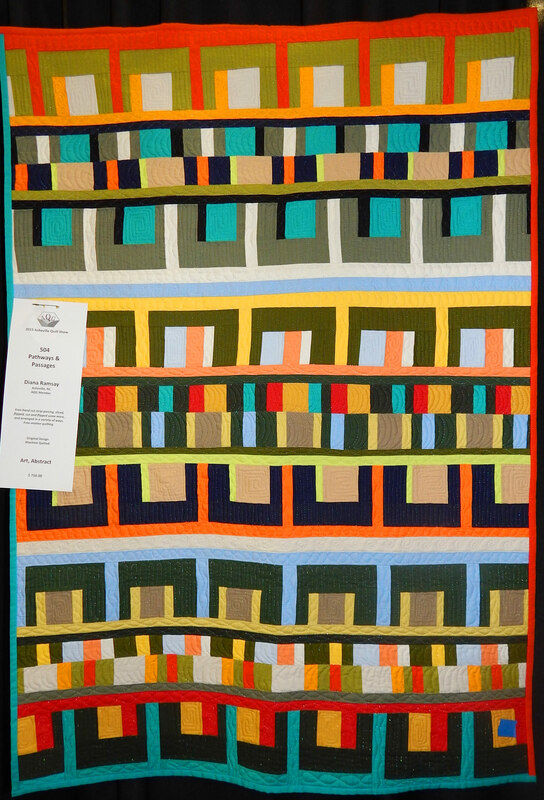 Back in Time, by Linda Hallatt, isn’t modern but it is very striking and well done. I just had to take a picture for my husband! 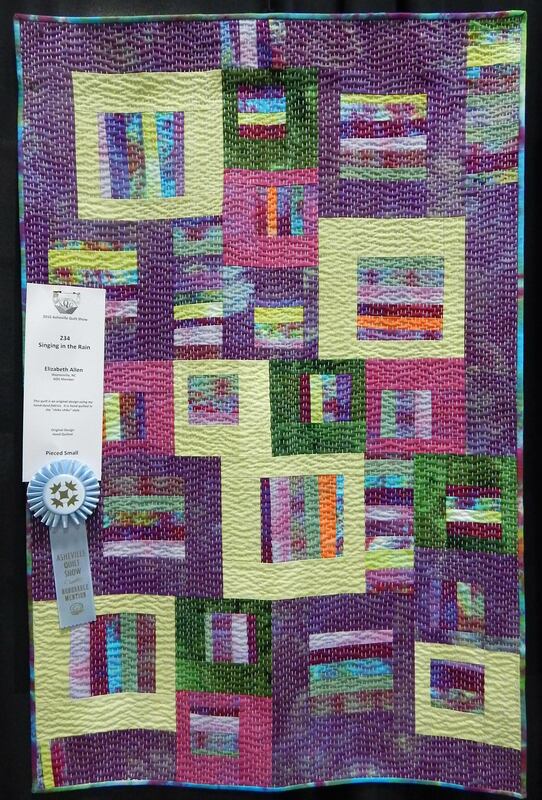 Purple Haze, by Connie Brown,. She says she made it many years ago, but I think it looks contemporary. 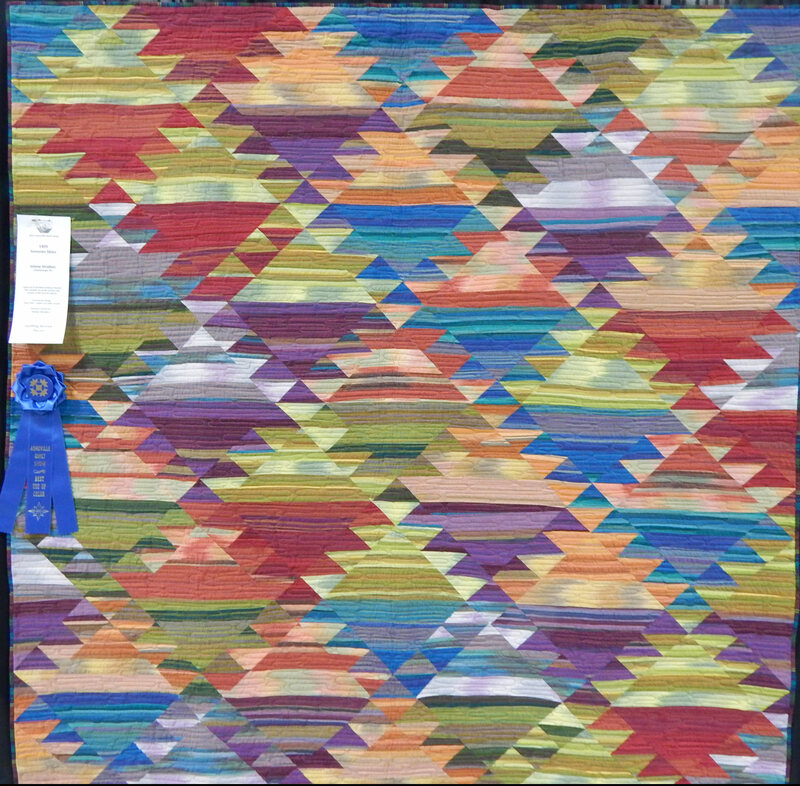 Geez Louise, by Connie Brown, was a fun quilt in the Modern category. 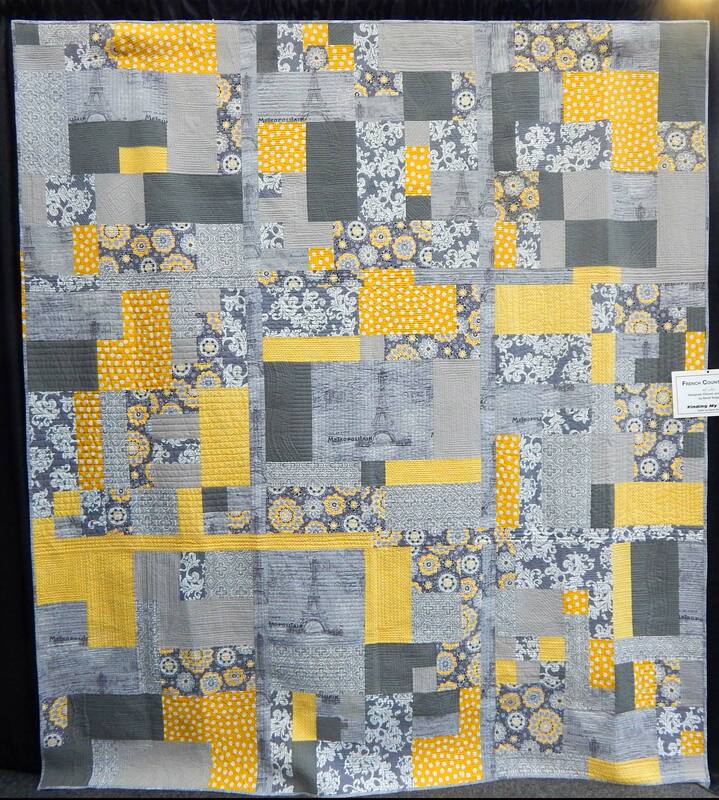 I wondered about the background fabrics with their mottled look. 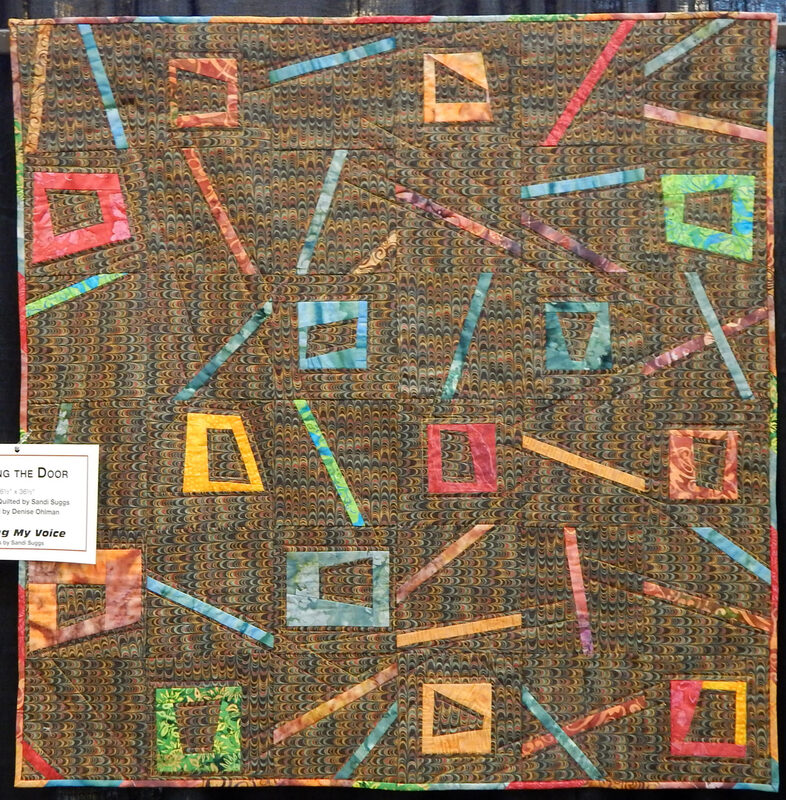 Pathways & Passages, by Diana Ramsay, was in the art quilt category but looked very modern to me. 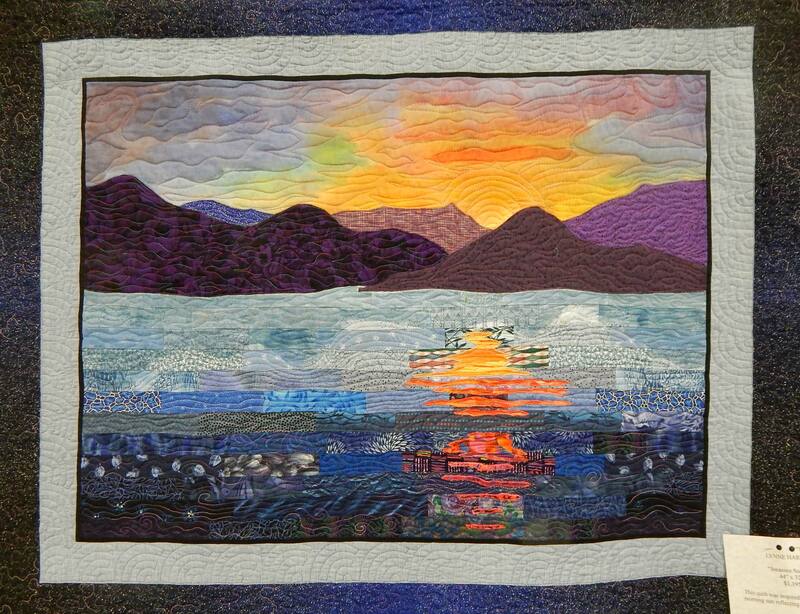 Finally, Jocassee Sunrise by Lynne Harrill caught my eye. Not modern, but certainly beautiful. 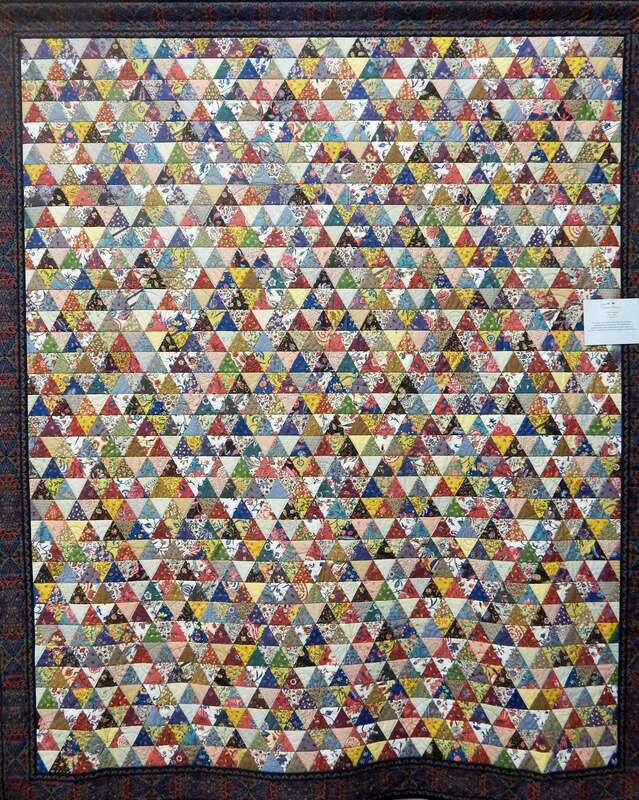 There were many more wonderful quilts, but I limited myself to the modern ones and those I especially liked. 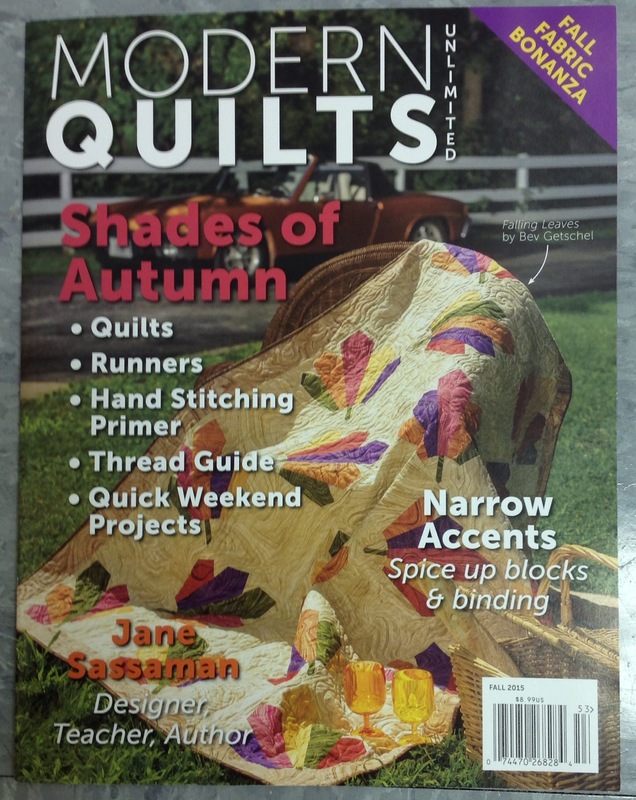 Modern Quilts Unlimited just published my article on how to add narrow accents to your projects. 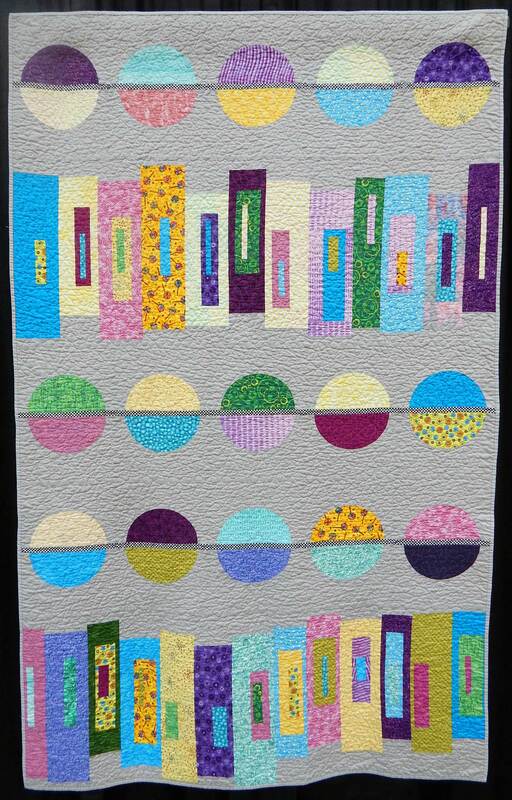 It’s a very easy method for sewing crisp, even accent strips from 1/8″ to 3/4″ wide. There are options too numerous to mention! Go get the magazine and make some accent strips, then please send me pictures of your creations. 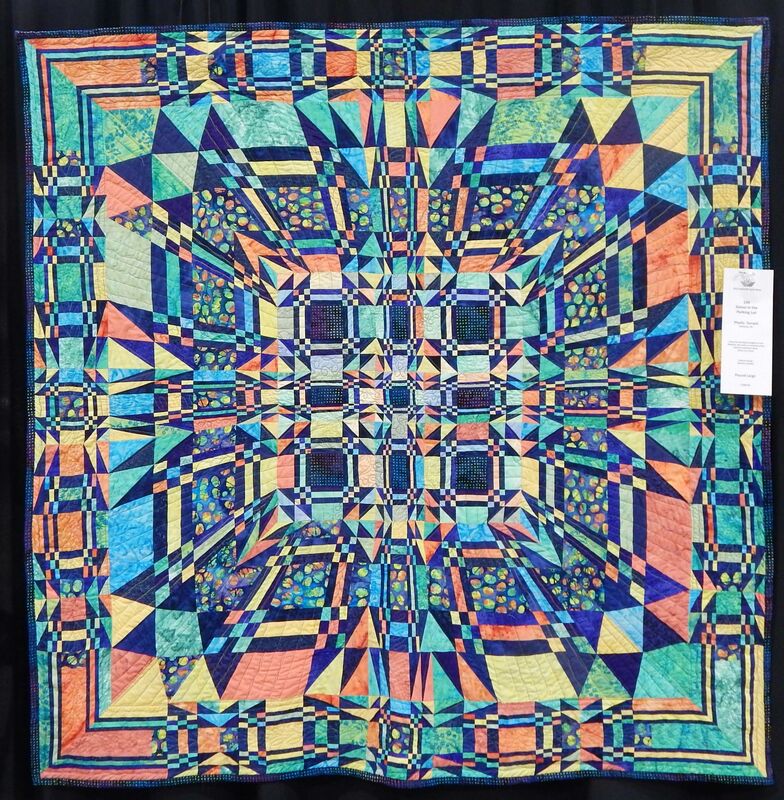 Sandi’s work was featured in a special display at AQS-Chattanooga, and I was lucky enough to get to interview her. I took some pictures, and if you want to see more of her work, check the links at the bottom of this post. 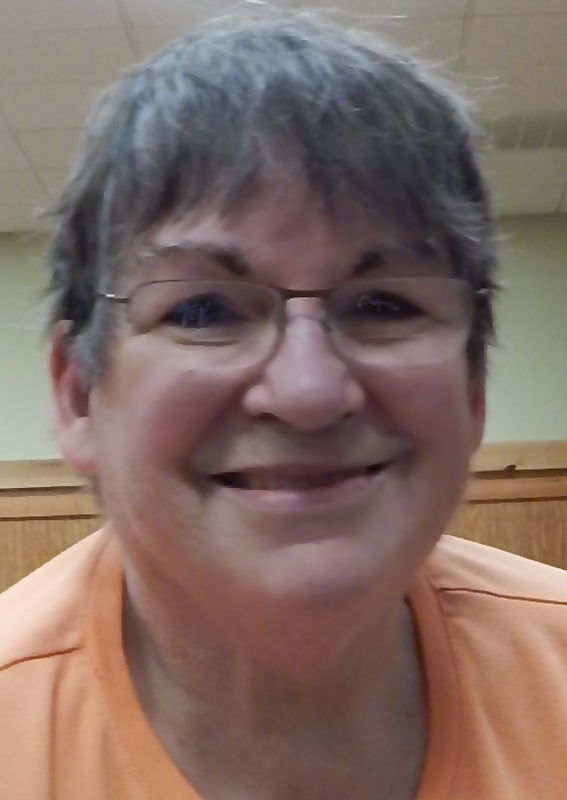 While I was waiting to interview Sandi, I heard her tell someone, “Any time I make a quilt, I do it to learn something.” My sentiments exactly! 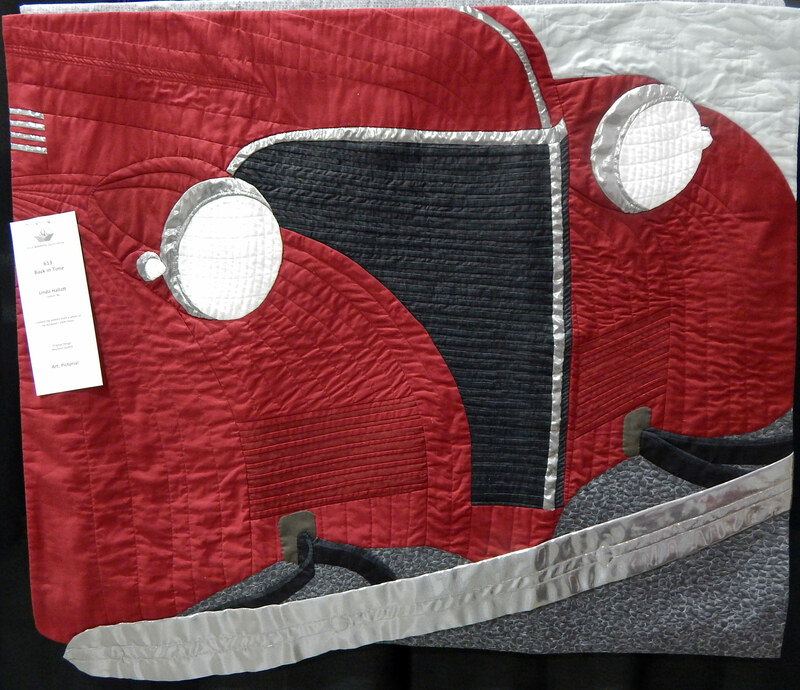 Sandi started quilting over 25 years ago, using cereal box templates because rotary cutters weren’t yet used for quilting. She still uses templates when appropriate, but a lot of things have changed! For one thing, she now uses freezer paper when she needs templates so she can cut several layers of fabric at once. 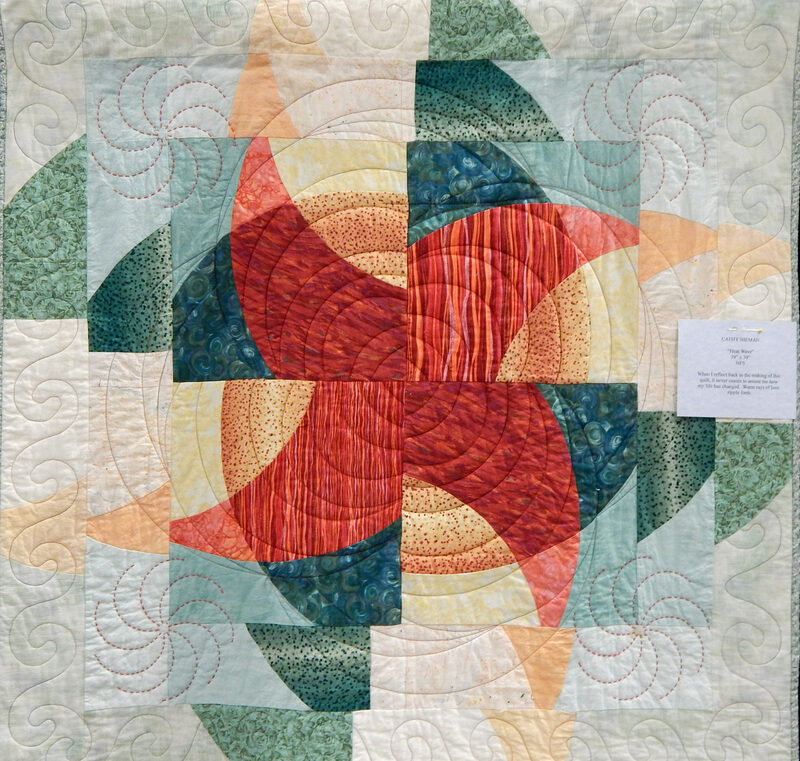 Round Robin quilt by Sandi Suggs and friends. 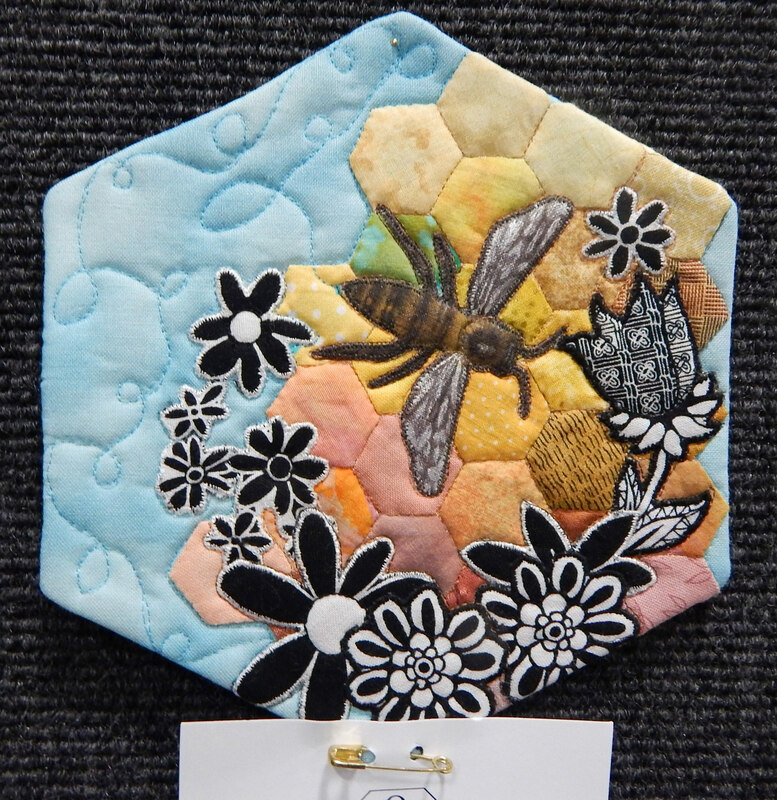 Look at Sandi’s quilting! 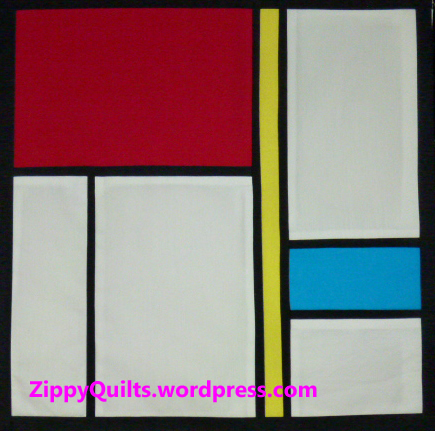 A couple of hints from Sandi: she likes to use the multi-stitch zigzag (stitch #4 on Bernina machines) in her quilting. 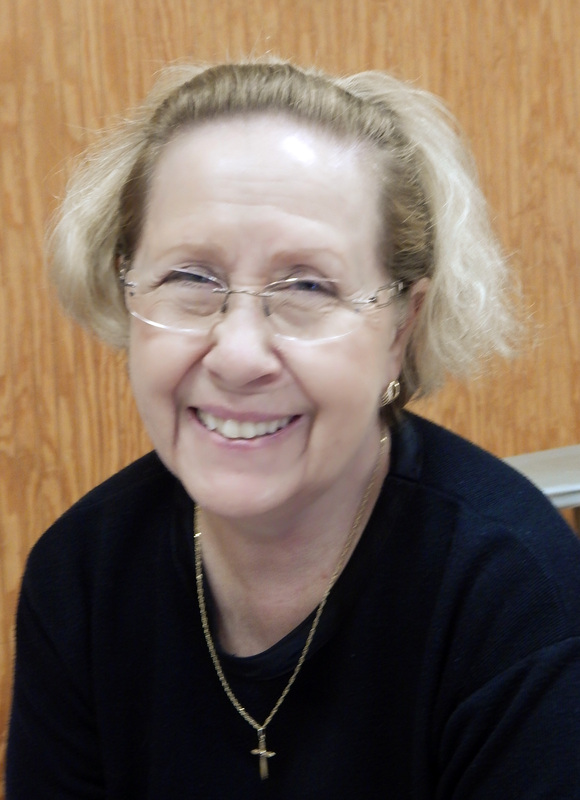 She starches all her fabrics before cutting to make them smoother and less likely to fray. 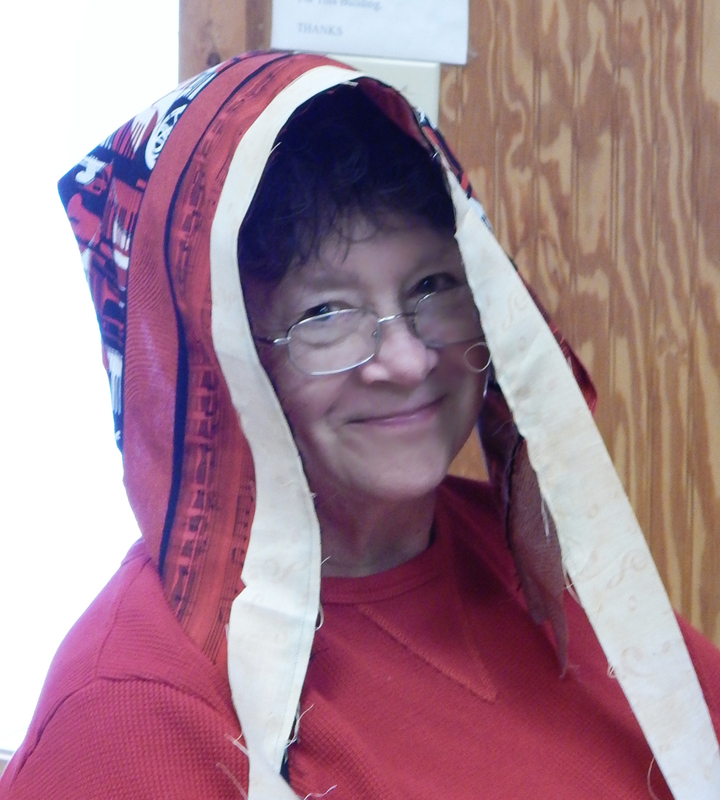 She says starching also equalizes the weight of the various fabrics. 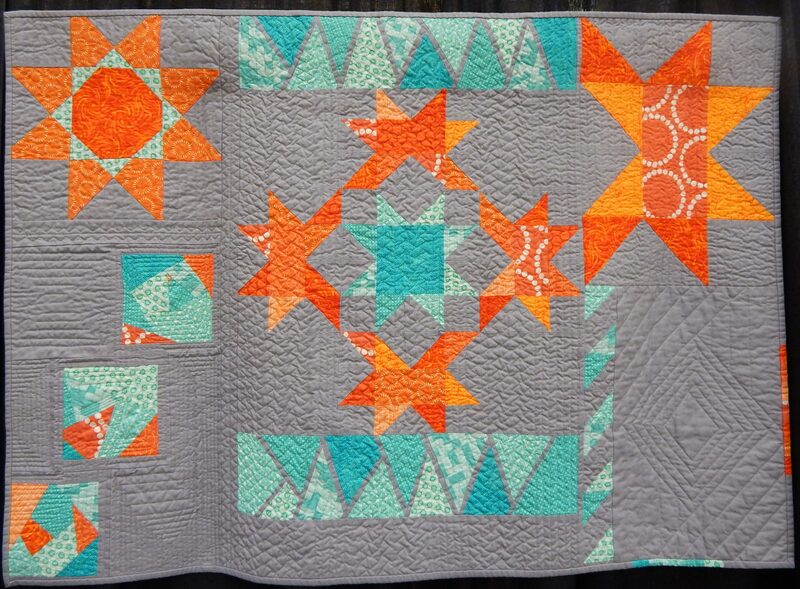 She likes to wash her quilts after they are finished to achieve a crinkly look that emphasizes the quilting. 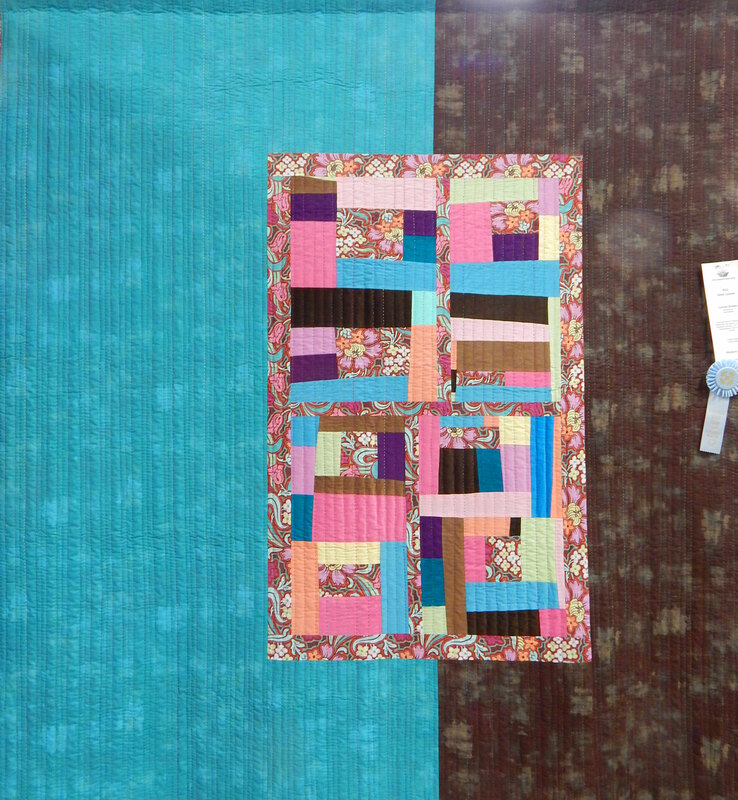 Sandi also has her own way to successfully select fabrics for a mystery quilt! 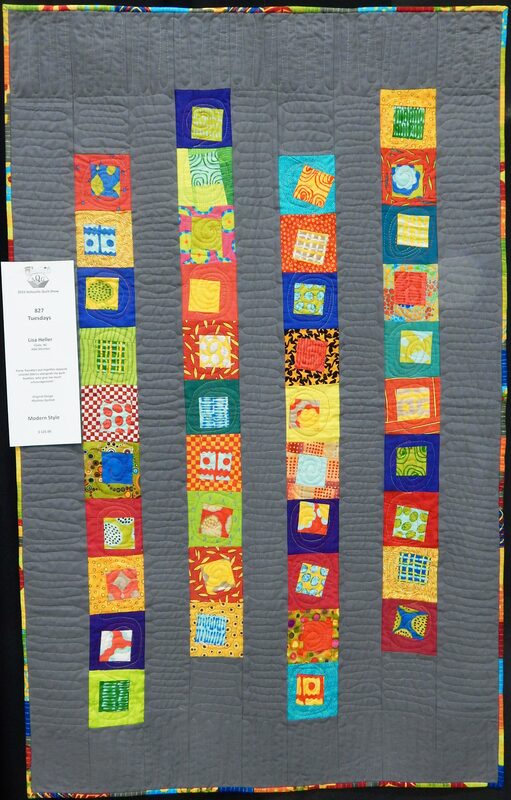 I’ve only done one mystery quilt and was unhappy with the result, so I asked her about it. 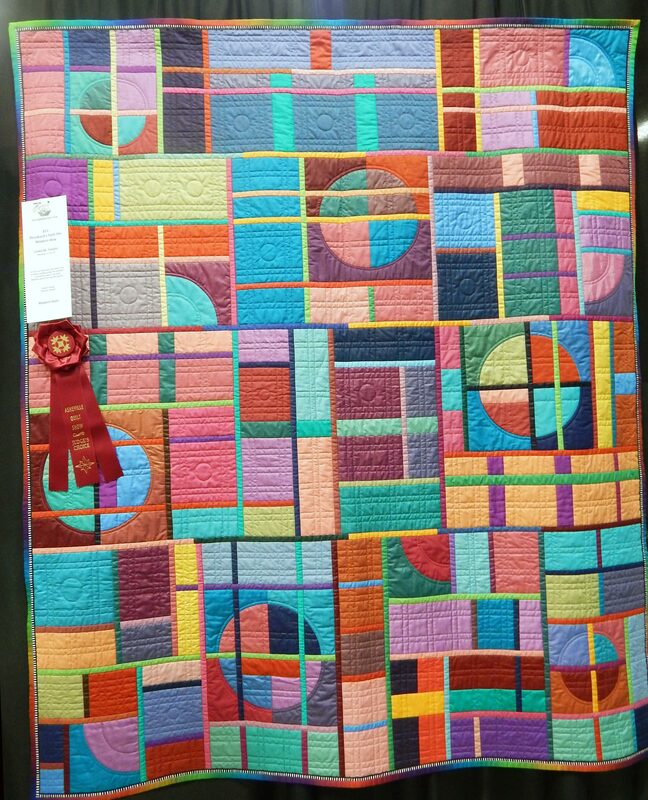 She showed the quilt below, designed by Weeks Ringle and Bill Kerr as a mystery quilt, and told me how she selected her fabrics. 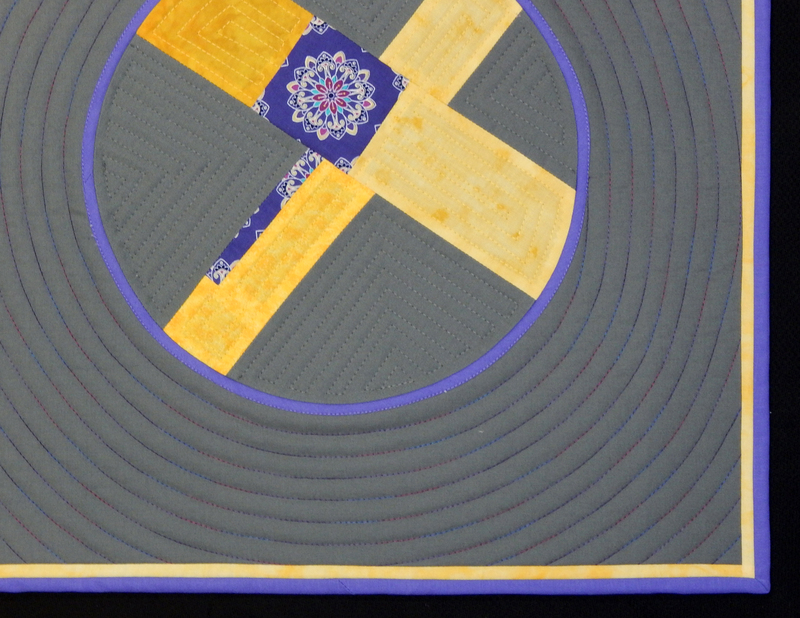 Sandi looked at the fabric requirements for the quilt and figured the largest fabric requirement was for the background. 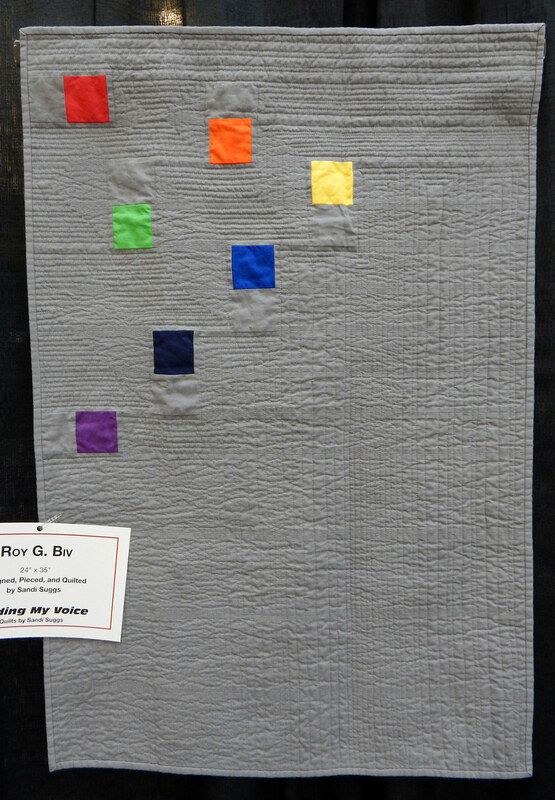 Once she had chosen gray for the background, she decided she would need bright fabrics to contrast with it. I think her decisions were very successful! 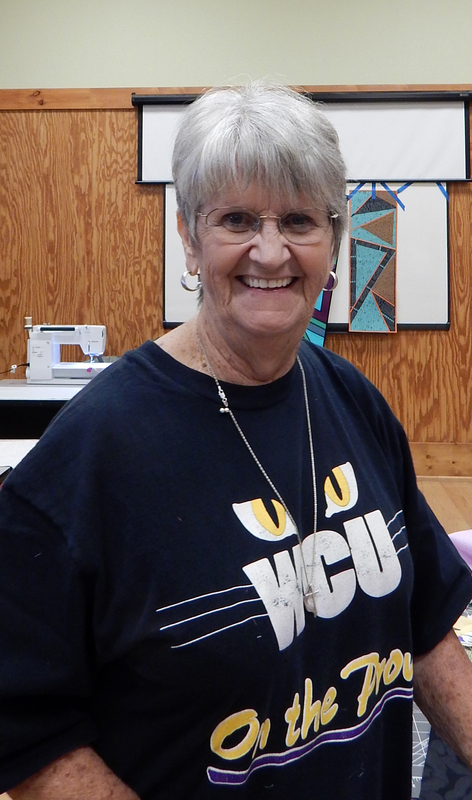 I had the opportunity to teach my new class, “Try Improv!” recently for the Smoky Mountain Quilters Guild in Franklin, NC. It was lots of fun and everybody made a successful table runner using techniques that were new to most of them. Here are a few pictures. Although I made 3 different samples for the class, there is no pattern. 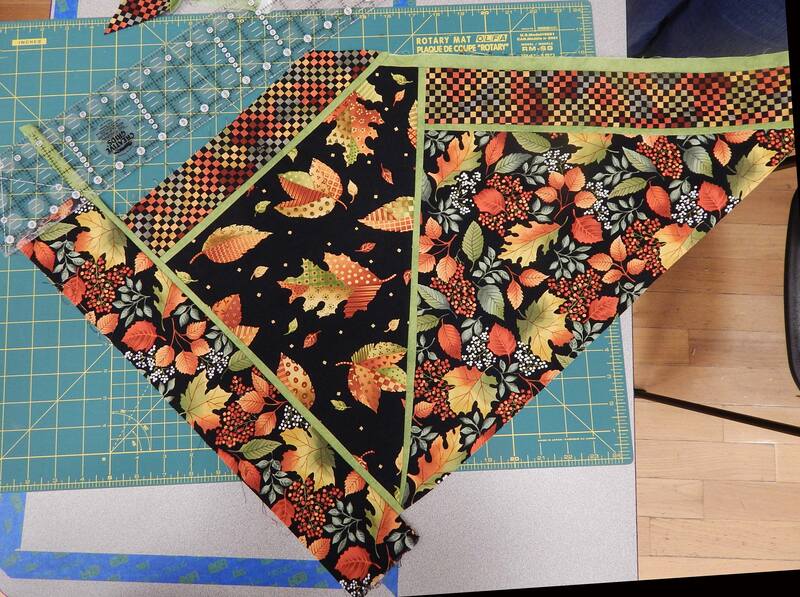 The goal is for each student to start with a few fabrics and improvise a table runner from them. Of course, I provided some guidelines and lots of assistance as needed. 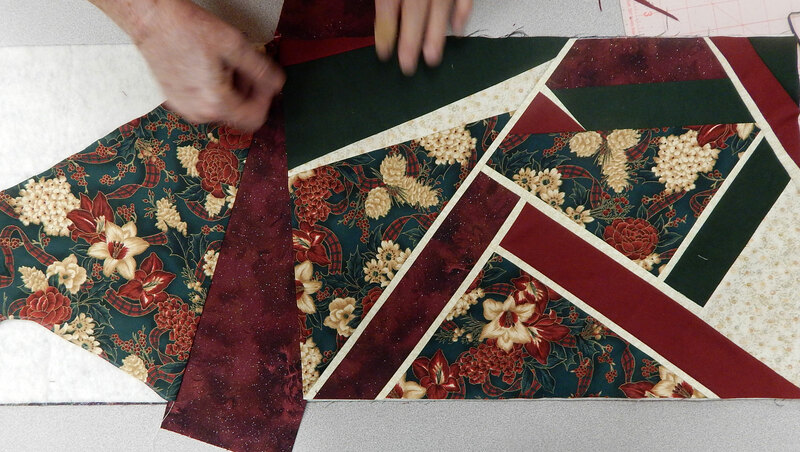 Susan brought Christmas fabrics and made a successful design by distributing several triangles on her template and then filling in with accent fabrics. 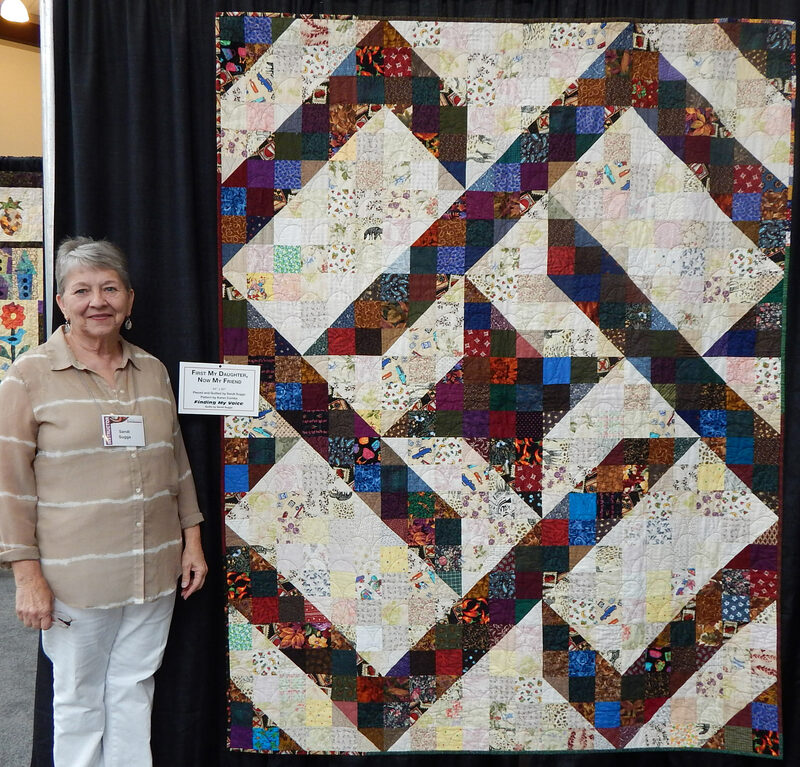 Nancy has been improvising for a long time, and said, “This is what I do all the time!” She chose a beautiful collection of iris-themed fabrics for her runner. 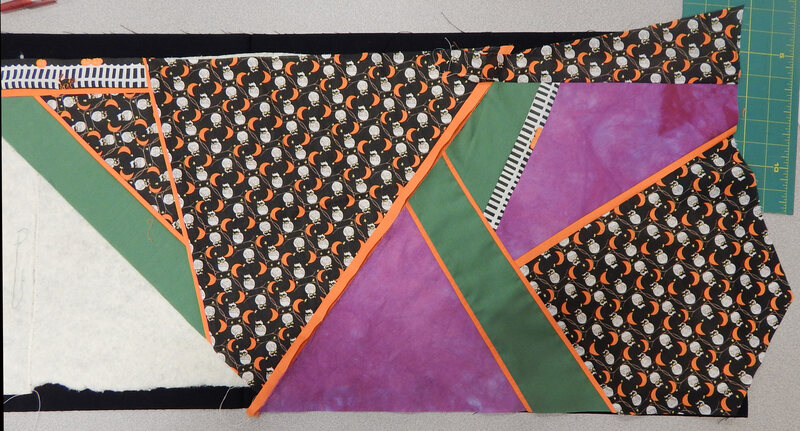 MaryAnn made a halloween-themed runner and zipped it up by adding some purple! 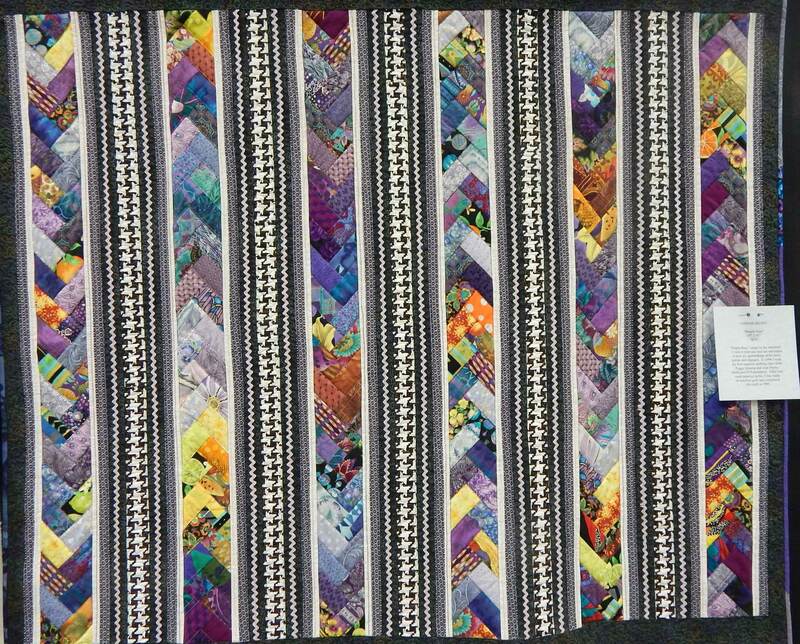 Maggie chose a collection of fall fabrics with a good variety of scale, then picked a coordinating green for her accent strips. 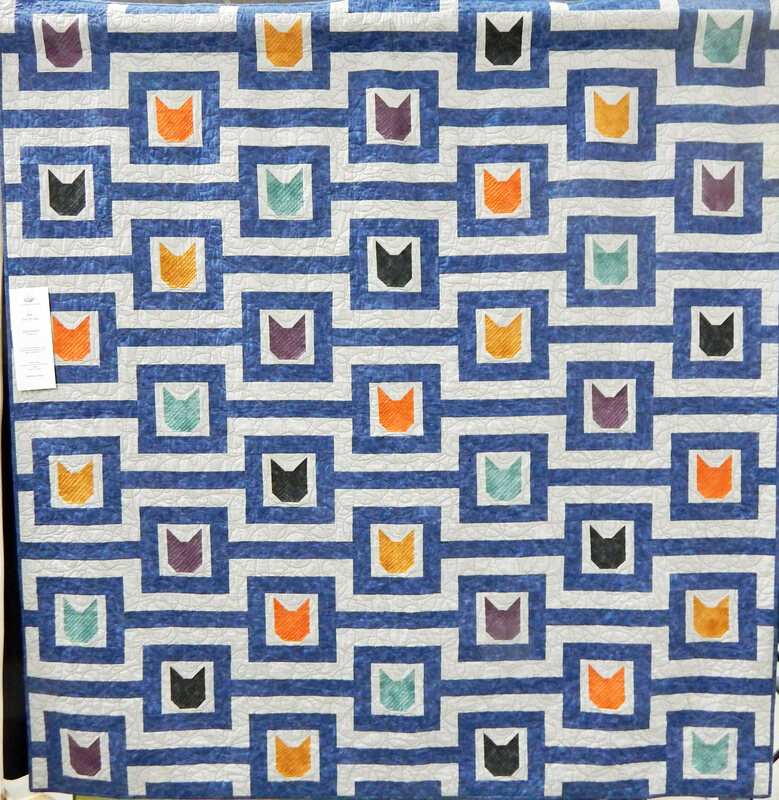 Chris had a nice bundle of blacks and grays as well as a stunning coral-pink fabric for accents. 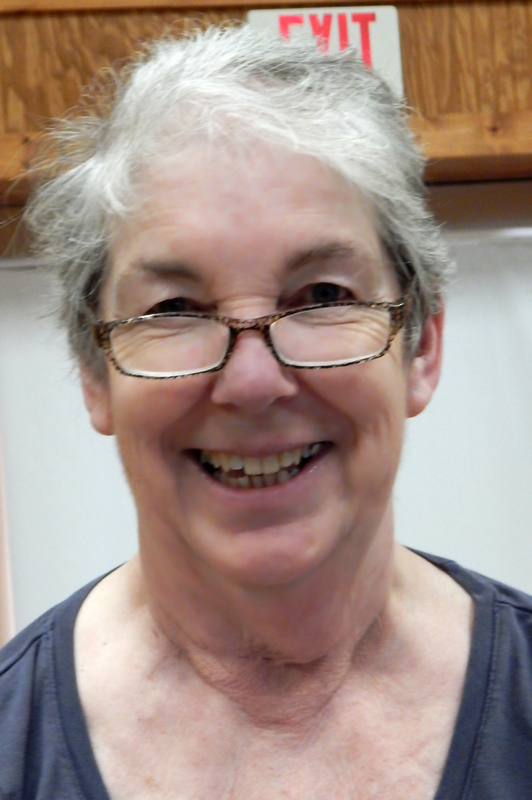 Pat made a lovely red and black table runner, but decided to model it rather than lay it on the table! As you can see, a good time was had by all!